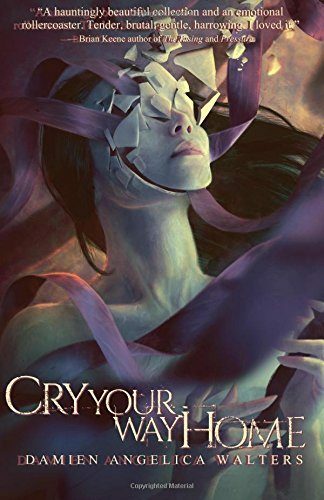 Damien Angelica Walters’s second short story collection, Cry Your Way Home follows 2015’s Sing Me Your Scars, also from Apex, and brings together another cast of strong women in unusual circumstances, fighting to be true to themselves and to understand themselves, regardless of what Legend, Story, or History tell them (and us) they should be. A number of these stories—including “The Serial Killer’s Astronaut Daughter” (in which an astronaut in orbit is blindsided by news that her estranged birth father is a recently caught serial killer), “Tooth, Tongue & Claw” (about what happens after a daughter is ritually sacrificed to a local monster), and “Sugar and Spice and Everything Nice” (which combines Mean Girls with The Usual Suspects in an original and witty way)—trade on explicating and then subverting the expectations we have of women and of girls. These stories and others delve into society’s expectations of women: how they behave under stress, how they adapt or fail to adapt to new information and circumstances. Spoiler alert: Walters’s protagonists rarely comply with what society thinks they should do. The best stories in the collection make the reader work to unpack, and then see past, the metaphorical/allegorical structure to the everyday truths which, as painful as they may be, underpin the stories. The language in “Not My Circus, Not My Monkeys: The Elephant’s Story” is nostalgic and lyrical, detailed yet ephemeral. The characters are presented as circus archetypes (ringmaster, acrobat, etc. ), the narrator the titular elephant—but who are they, really? By using circus imagery and titles rather than “real” names, Walters elevates a tale of domestic neglect and attrition into the mythological. This is one of those little masterpieces that sticks with you, that you find yourself revisiting to see if there’s another strand of imagery to tease out and analyze. A similar thing happens in “The Judas Child,” where the author ruminates on what happens when, rather than being rescued (like Red Riding Hood) or rescuing themselves (like Hansel and Gretel), the child in a fairy tale decides the only way to survive is to become complicit in the monster’s horrible acts. What toll does this “Stockholm Syndrome” take on a young psyche? As with the characters of “Not My Circus,” I am still not convinced the monster in “The Judas Child” is a literal monster, even after several rereads. In a similar vein, “The Floating Girls: A Documentary” never quite concretely answers the question of whether the “floating girls” of the title were a real phenomenon or a sort of mass-hysteria event to explain disappearances due to kidnapping or suicide, but the haunting imagery Walters uses to describe them lingers with the reader long after the story is finished. The author is also not afraid to retell fairy tales with a more modern sensibility or undercurrent. “A Lie You Give, and Thus I Take” intersperses aspects of several classics (from a gingerbread house to dwarves to fairy godmothers to slowly expanding cracks in the walls of reality) in a second-person narration that asks the reader to question why fairy tale characters, male and female, all bleed together after a while and how stories overlap even when we think we’re the focal point of something new and unique. These seventeen stories fall mostly into the horror and dark fantasy genres, whether they are Lovecraftian or psychological or somewhere in between. There are only a few (like “The Serial Killer’s Astronaut Daughter”) that have a veneer of science fiction over the horror aspects, and this is not surprising given the author’s stated love for the movie Alien. They were also all published between 2014 and 2016, and don’t represent Walters’s full output in those three years. I hope another collection, as strong and engrossing as Cry Your Way Home and Sing Me Your Scars, is forthcoming sooner rather than later.